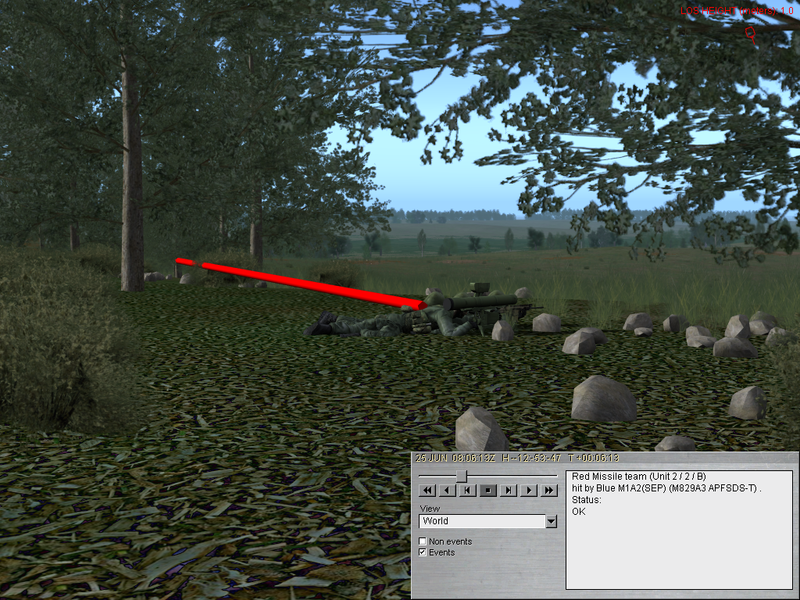 Having just spent my last loaded TOW missile to no apparent effect, out of desperation I told my infantry to "GET OUT!" and decided to spam some 25mm at this T-55 to at least, hopefully, smash some things up so my troops could get out and set up. Range to target here is rather short, probably 500m or less. Is this a small leak in the armor model, or did I luck out and hit a thin spot? I´d say that the 25mm bushmaster ammo should be able to penetrate 1st generation armor, yes. Not always or in all circumstances, but it does not surprise me. It probably was tested in the 91 gulf war, in any case. The M919 can proably punch trough there...the "destroyed" part is a bit harsch tough. Fragments hitting a HE shell is the onyl thing i could think of IRL. doen't prove the case with one trial. as everyone knows, steel beasts rolls dice and that means you will occasionally get counter intuitive results, if you like. the flip side to something like this was when my bradley put a tow missile right into a t-55 turret ring under the gun, no components damaged, no crew damaged or killed. and of course, you almost sense it coming- the t-55 returned fire and killed me with one shot. frustrating, but it will happen. however, i look at it like the law of averages, barring some obvious, demonstrable flaw occasionally discovered in a vehicle's hit model, it probably all evens out, that is, over large enough trials you'll likely be rewarded with about as many lucky hits as you are penalized by unlucky hits. Ironically, I switched to 25mm spam because I had aimed my last TOW missile right at the turret ring under the gun, and it didn't even scratch him! Rather than sit there and take it, I told the infantry to bail out, overrode the gunner, switched to AP HI and let it rip and prayed. I didn't expect to destroy it, but thought I might get lucky and break the main gun or some fire control stuff. now this may be a problem, since it seems to square what i've seen before. occasional 'bad' results are one thing, but if it's consistent, maybe esim should have a look. 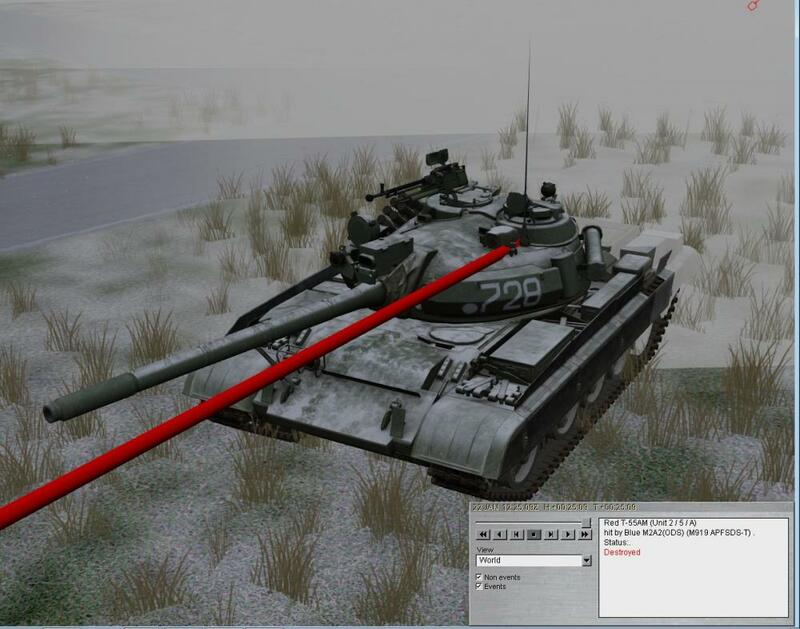 if the bushmaster always penetrated the t-55 at that turret location, that should be a problem, since even tank main armament doesn't even do that. once in a while- chalk it up to the dice roll. on the other hand, more consistent results with a tow hit at that location may be suspect. Hit in the TC cupola base should do the trick in some way, at least killing TC. Cupola base is ~100mm thick. Well...I did kinda dump the entire AP ammo load into that tank, so...That's a lot of dice rolls! while on the subject, i've seen an infantry unit survive a grazing hit from apfsds, which would be a kill for any practical purpose under any circumstance i can imagine. is there a dice roll associated with a scenario like that? As the command group approached the screen line, HQ63 (Bradley) spotted a T-72 at close range in turret defilade, with turret traversing. Upon backing up, HQ63 acquired the T-72 and an additional tank, a T- 55, as well as numerous dismounts. 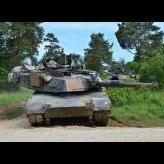 Keeping the tanks under observation, the command group requested assistance from a B Troop tank. After maneuvering to the T-72's right flank, the B Troop M1A1 destroyed the tank. HQ63 destroyed the T-55 with 25mm through the turret and hull. So maybe the answer here is that this is actually accurate. I wasn't actually expecting to get a kill, but I was hoping that I could break the GPS, maybe even take the main gun out of action, or otherwise simply distract my target for long enough to let my infantry get out and into a position to hit it with an AT-4 or Javelin, but I guess a 25mm kill is still a kill! b) the lower we set the likelihood of such an event - say, 1% - the more it will appear as a bug because it's such a rare occurrance. But then again, we'd use that low likelihood precisely because it shouldn't happen in most cases. I suppose this is how legendary war stories are born (of those who were lucky enough to survive such a high-risk encounter). There is a long standing issue where limited extent 'thin' surfaces hit nearly parallel act as 'infinitely' thick. Frequently seen with ATGM or large APFSDS hits on track or trackguard (or at the hull top in the way of the turret ring), where even BMPs will sometimes 'bounce' a shot. The maximum extent of armour from such an impact should be the LOS front-rear distance along the trajectory, rather than the naive thickness/cos(alpha), IMO. Yes... in a perfect world. Like so often, this is a matter of choosing priorities (and choose, we must). In the big picture, this is a relatively rare occurrence (not so rare that you would never notice it, but also not something that happens "all the time"), so it's "somewhere in the middle" of a rather long to-do list. it's not really the cupola per se that you are penetrating, rather there's a tiny "lip" around the gunners IR sight with a max thickness of about 23mm, and an IR sight with a thickness of 7mm. that when hit will penetrate into the main turret. similarly there are minor weakspots to the right and left of the gun (the GPS and coax ports) that when hit might kill the tank. as for "kill" in SB, we don't simulate crew fleeing the vehicle, unfortunately, but to make up for this, we have something called "mesh" damage, which also incorporates a silent kill of the vehicle. in other words, it's an oversimplification of a real world occurence. the gunshield should be a kill, the TOW has an overmatch of over 500mm even when hitting the lower extreme lip of the gunshield. the only thing that comes to mind is that you are hitting the side of the inner gun tube at a close to 90 degree angle, and due to the low damage % on the gun tube the damage is completely nullified. I think this randomness is a good thing. Remember in RL there are many issues that could cause these issues to happen, a faulty missile in the case of the TOW or a poorly riveted or welded armour joint in the 25mm issue causing significant spalling in the vehicle. Sometimes the result isn't always what the book (or the weapon manufacturer) says it will be. random, but sensibly random. if for example shooting tank in the track had the same random chance of a catastrophic detonation as hitting the ammo magazine, then you would sense there is something off. the other night i was testing a scenario of a company sized engagement of t-62s vs t-55s, and it was as if i was caught in the twilight zone. it was as if i ended up by random chance in some strange part of the universe which shouldn't exist. i am not exaggerating when i say it was just one of those things were it was so absurd that i almost could sense how it was going to turn out. one by one my t-62s were getting picked off and destroyed by single hits from the t-55's, on the other hand, nothing could kill the t-55s. repeated and multiple hits from all aspects, multiple hits on the sides of vehicles, we did not destroy a single t-55, literally all i heard was: "target. re-engage. target. re-engage. target re-engage." at the same time: "we've lost a tank. we've lost another tank..." the AAR confirmed that virtually all of my T-62s were being killed from single hits and not a single t-55 was killed no matter where hit. in some cases the t-55s were damaged, but the coop de gracey just wasn't coming up. i finally got down to my last t-62, i managed to turn the flank on a t-55 at about 500 meters, lined up a shot right into the side, "target. re-engage." then i just knew how it was going to turn out: i was going to get off one more shot, but i would be deprived the satisfaction of at least one kill before the scenario ended. and that's what happened. after reloading, i put another round into the side of the t-55. target. re-engage. 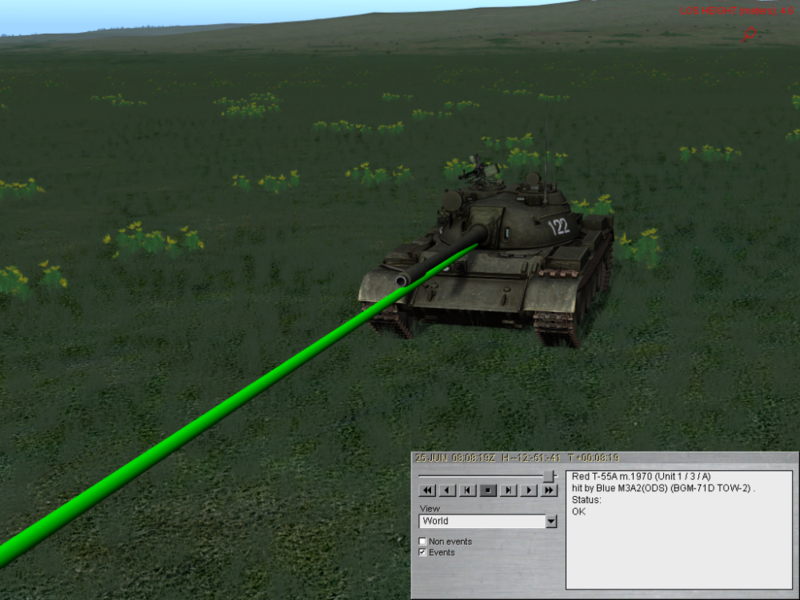 then the t-55 picked up my location, turned to face me head on. i saw the gun turn towards me, and i could sense after all the injustice of not being able to kill a single t-55 it was going to rub my face in it and kill me with a single shot. that's exactly what happened, i would have bet on it and i would have won. AAR, or it didn't happen. you wouldn't believe it anyway- remember those links i showed you? it's not my mission in life to waste time making up stuff like that. Sounds like you had a dodgy batch of rounds. Erst hatten wir kein Glück, und dann kam noch das Pech dazu. So it didn't happen then?